Hundreds of IAM activist women from across North America are gathered in Las Vegas last week for the 2019 IAM Women’s Conference. 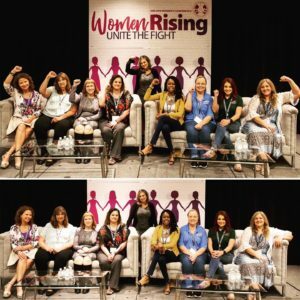 The theme of the conference was “Women Rising: Unite the Fight.” The agenda included an array of guests and panel discussions, to support the ever-increasing role women play in the labor movement. Among the opening day speakers was IAM International President Bob Martinez. Local Lodge 463 sent four of our Sisters to this event: Sisters Terri Erickson, Shannon Hanks, Julie Snyder and Holly Smith. Another of our Local Lodge Members, Grand Lodge Representative Valerie Rodriguez was also in attendance on behalf of the Grand Lodge. Pictured here are ladies from across our Southern Territory including our Local Lodge 463 Sisters.